A lazy guy’s guide to the Columbia River’s shores. COVERED IN MUD from head to toe, I surveyed my options. On one side was the Gifford Pinchot National Forest, which encompasses Mount St. Helens, Mount Adams, and 1.3 million acres of some of the harshest and most barren wilderness in Washington State. On the other side was the cold, wide Columbia River. Its currents were treacherous, and I knew if I fell in my chances for survival were slim. I had to make the right decision. So I let my masseuse—a very pleasant woman from New Jersey named Eileen—wrap me in a warm, cotton blanket, which was part of the Rejuvenating Mud Wrap treatment at the Skamania Lodge’s Waterleaf Spa, where I wallowed. After a short nap, I showered off the mud, took a sauna, and decided which bottle of wine to have with dinner. You know, really roughing it. The Skamania Lodge in the tiny town of Stevenson may be in one of the most remote areas in Washington, but its creatures are comforts, and the worst exposure one can suffer here is getting chilled while scampering to the most-excellent outdoor hot tub. And rural Skamania County—a two-and-half-hour drive south and east from Seattle—may not have the cultural attractions of, say, Wenatchee, but few places can compete with its natural beauty. The show begins as you head east on Highway 14 from Vancouver and pass through the Portland suburbs of Camas and Washougal. The Columbia River’s to the right, tall mountains straight ahead. 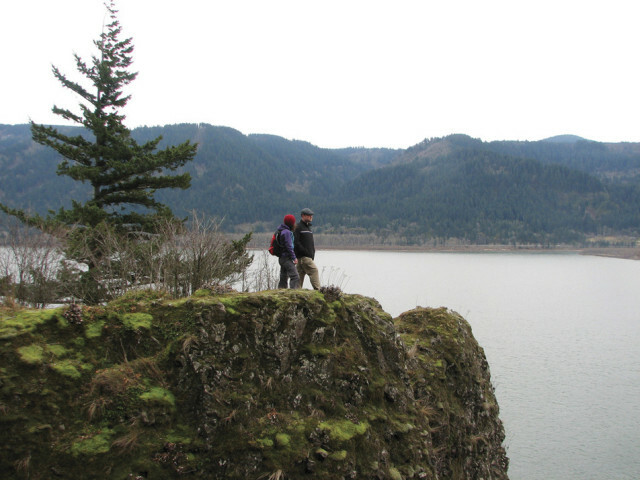 Entering Skamania County puts you on an ascending path up a headland that, hundreds of feet in elevation later, comes out to reveal a stunning vista at Cape Horn, with the river now far below and cutting through mountains on both sides. This is the beginning of the Columbia River Gorge National Scenic Area, an 80-mile long stretch of the river where the canyon walls can rise as much as 4,000 feet, seemingly straight up. Later there’s Beacon Rock State Park, named for a sheer, 848-foot column of basalt, a landmark for everyone from Native Americans to those intrepid bad spellers, Lewis and Clark. In October 1805, with their long, painful slog to the ocean nearly finished, Clark wrote of a “remarkable high detached rock…we call the Beaten Rock.” On the return trip the following year, they amended it to Beacon Rock, which became the official name in 1916 after a few years of being called Castle Rock. 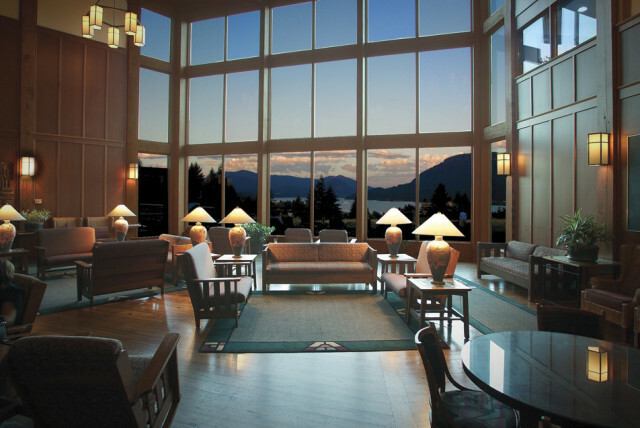 Skamania Lodge in Stevenson is the perfect base from which to wage a campaign of extreme loafing. Spying Lewis and Clark’s path prepped me for my own expedition—beginning at the doorstep of Skamania Lodge. The pine-trimmed lobby is dominated by a two-sided stone fireplace with a wide hearth and a roaring fire, with rocking chairs and sofas positioned for quiet reading or contemplating flames; the other side of the room has soaring, cathedral-size windows overlooking the river gorge. The 254-room manse, built in 1993, was a joint venture of the Columbia River Gorge Commission, the U.S. Forest Service, and the county of Skamania, among other partners. The purpose was to bring more tourism, and more jobs, to the area, which was hit hard by the collapse of the lumber industry. This humble origin is reflected in the neighborly hospitality extended by the resort’s staff, most of whom hail from the area and nearly three dozen of whom have worked here since it opened. While there I caught up on reading in the library on the mezzanine, hit up the Waterleaf Spa—where one can indeed be massaged and covered in mud by aestheticians—and avoided by any means necessary the fitness center and indoor pool. I also chilled in my room, a Mission-style number with ultra-loaf-worthy leather armchairs (Tip: Upgrade to a deluxe river-view room for a fireplace and a deck with eyeshots of the gorge), and thought a whole lot about the 18-hole golf course, the private walking trails, and the activities desk where the beaming concierge will hook you up with windsurfing lessons or guided hikes to view wildflowers. 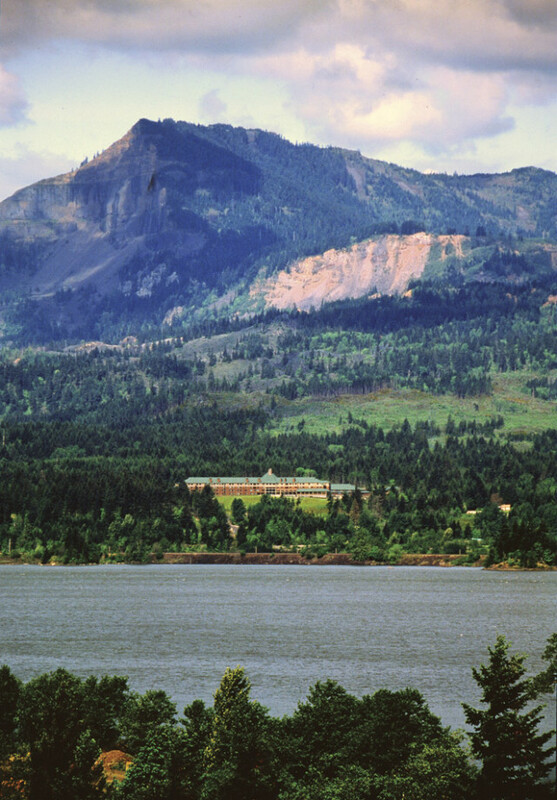 The resort’s 175 acres include dense forest, a golf course, and some of the best Columbia River views in the land. Speaking of wine, I didn’t just lie around the lodge my whole visit. Sheesh. I also sallied forth on Highway 14 in search of the good stuff. Along the way mountains gave way to the rolling farms and pastures of the east. The road hugged the river’s edge and a tugboat pushed a huge barge west toward Portland. Then the asphalt entered tunnels drilled through the mountains, and a long train chugged along a nearby track. I ended my journey at the Maryhill Winery at Goldendale, which has a lovely terrace overlooking the river and rows of vines that produce the grapes for the winery’s award-winning (and bargain priced) cabernets, chardonnays, and unusual varietals like malbec and barbera. Thus pleasantly invigorated by the majesty of nature and fortified by wine, I backtracked to Skamania Lodge, where more wallowing commenced. Look, there will always be Paris. The economy will get better. We could gnash our teeth and rough it in the wilderness from now until Christmas, and forage for grubs and roots for sustenance. But honestly, why would we when the Skamanians have done so much to keep us dry and warm and well-fed?